Your horse’s path to calmness confidence and better performance in no time. What are the SURE FOOT pads? SURE FOOT pads are the tools utilized for the SURE FOOT Equine Stability Program. At this time we are not sure exactly how the standing on pads brings about the changes observed in the horses both while standing on the pads and afterward. We hope to be able to research this at a future date. SURE FOOT makes the horse aware of how he is standing, offers him comfort and allows him the opportunity to explore new ways and/or rediscover more efficient patterns of standing, calmness and greater confidence. The pads get stiff in the cold. Do they still work? Yes, SURE FOOT pads will get hard in cold weather but they still work in cold temperatures. If you prefer you can keep them in a warm room. Should I allow my horse to eat hay if he chooses when using the pads? Typically I prefer the horses focus on the pads rather than eating. However, eating is an indication that the nervous system has switched from the sympathetic, “fight and flight” mode to the parasympathetic “grazing” mode, which is commonly observed when using SURE FOOT. Therefore, if you feel that the horse is still involved in the process it is fine to let them eat while on the pads. Do you have experience with horses that have nerve problems caused by an accident? SURE FOOT customers have used the pads with horses that have had EPM, a neurologic disorder caused by an organism after they have been treated, shivers, a type of nerve problem that is not fully understand, Lyme Disease and sweeny, muscle atrophy as a result of nerve damage. While SURE FOOT cannot cure an underlying medical issue it can alleviate discomfort and help horses regain function. Therefore, we can’t say that SURE FOOT will solve your horse’s particular problem may help. Could SURE FOOT be just as effective working front then hind or is it best to do all four at the same time? It’s not so much “best” as “different”. When a horse stands on two pads they still have two on the solid ground. This will be a different experience for them than having all four feet on a surface that gives. It is important to recognize that not all horses can stand on four pads. Or it may take time before a horse can stand on four pads. Horses will benefit from standing on two pads. The Starter Pack (two pads + DVD) is a great way to get started with a minimum investment. You may have had some that you have to work up to it, others that won’t and still others that will go on 4 pads in the 1st session. Standing on 4 you can watch the horse “experiment” with shifting weight, swaying or quick rocking. Can’t way what your horse will do as it is unpredictable what your horse will do. Not sure if this helps but that’s why I have the complete package with 2 blue and 2 green pads so that you have the options of firm, soft and have 4 pads. If you are talking a heavy horse you may want only green. Is it possible to introduce a horse and owner to SURE FOOT pads with the DVD? How do I use the pods? Once your horse is acclimated to the larger pads you can start using the pods. Your horse has to allow you to guide his hoof otherwise he is not ready for the pods. Aim the toe to the third row of dots from the bottom as you lower the hoof onto the pod. Observe how the hoof loads. You may see toe loading (heel high), heel loading (heel low) or what I call “straight” loading, through the center of the hoof with the leg bones aligned. The horse’s reaction can be totally different from the pads, which give under the horse’s weight. I have observed horses yawn deeply when standing on the pods even after many trials with the pads. The pods are air-filled and, due their small diameter, push upward into the hoof as the pressure inside increases with the weight of the horse. I often use pods in front with slants behind although I have had horses that prefer pods under all four hooves. Is there an image of a horse on the pods? Go to Facebook and look at the SURE FOOT Equine page you will see an image of a horse standing on two pods in the front. www.facebook.com/pages/SURE-FOOT-Equine/1600668076833774 “Like” the page you so that you receive SURE FOOT updates. Can the SURE FOOT pads be used on horses with shoes on or does it require the horses to be barefoot? You can use SURE FOOT with both barefoot and shod horses. Both may cause damage to the pads over time. The bare foot horses tend to cut the pads while shod horses tear it. But the pads work equally well with or without shoes. I have limited use of outside facilities, like a ménage, arena or paddock (say due to poor weather). What is you recommendation, routine or process in using the SURE FOOT pads? You can use SURE FOOT in the barn or stall. If in a stall be careful around the horse especially if this is his first time on the pads. Always think of safety first. The process would be the same, letting the horse tell you what he prefers in terms of which hoof and how long he wants to stand on the pads. Would you always walk the horse around in between standing on the pads? If at all possible I prefer to walk the horses between sessions on the pads. 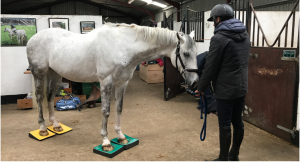 This allows the horse to integrate the information gained while standing on the pads and let him experience how his hooves meet the ground after each time. However, it is not always possible given weather conditions, the environment, or if the horse is lame or in severe pain. Therefore you have to take your situation into consideration. You can always stop if you find you do not have enough space to work. My horse will only rest the toe of his hind hoof on the pad. When I ask him to stand on it fully he steps aside or tries to walk away. If I position his resting foot on the pad and try to place an additional pad under the diagonal front foot he move sideways and refuses to stand on the pad with his hind foot. I was just wondering how you would deal with this one and what else I can try? I typically let horses rest the toe or stand how they choose. I might ask a couple of times for him to put weight on the hoof but it¹s ok if he doesn¹t. Clearly your horse didn¹t want to load the hoof but liked resting the toe otherwise he would have moved his hoof off right away. Often they shift to stand fully on the pad if I leave them on the pads for a few minutes. You might also try putting a pad under the lateral front leg first. Then that hind hoof. We never know what is really going on inside that head so I always assume the horse knows what is best for him. Remember that observing what they do is just as interesting and important as standing on the pads because they are showing you how they feel. Also given your observation about the pelvis, I would suggest you have that attended to and see how it changes the way he stands on the pads. SURE FOOT can often guide you to an underlying source of a problem. Have you had a horse stand with both hind feet on one pad? Yes, I have seen horses attempt to get both feet on one pad both in the front and rear. I am not sure why they prefer this to a pad under each hind foot. I purchased 2 green and 2 blue pads, so I will not be able to stand my mare in 4 pads of the same density. Is it any problem to stand her, for instance with the front feet in the green and the back ones on the blue pads or vice versa? Would SURE FOOT benefit an older horse with arthritic issues? Yes, I have a number of older horses that really enjoy their time on SURE FOOT pads. Be sure to let them tell you, which hoof to place the pad under and do not make them stand longer than they desire. Older horses may stand for longer periods of times on the pads. Can SURE FOOT help horses that twist their hocks? It appears that it can! I have a client with two 30+ year olds that have stopped twisting their hocks as a result. This happened over the course of 2 years, the owner doesn’t really know when it stopped. She one day realized, while riding behind them that they weren’t twisting anymore! How often to use the pads and over which period of time? This depends on your horse. Some horses prefer to stand on the pads every day while others like them for several weeks or months and then no longer want to stand on them. Some horses will stand near the pads and position themselves to indicate which they want a pad. If your horse loses interest suggest you give him a break and offer them again after a month or so. Every horse is so different that you need to closely observe your own horse and see how he is responding. Is it O.K. to place all four feet on the pads right at the beginning of a session, when the horse is familiar with SURE FOOT? Of course, only if he wants to? Yes, if your horse is already familiar with the Program you can go right to four pads. You may want to experiment with the slants and pods at this point also. Are there any precautions with using SURE FOOT every day? Yes. First be sure to closely observe your horse. If you see a lot of swaying you may not want to use the pads every day because some horses can get body sore. While standing on the pads the horse is using his postural muscles in a different way, just like you if you were to stand on an unstable surface or sit on an exercise ball for the first time. If he has not been using these muscles efficiently for a while they can get tired quickly. Therefore, if your horse does not want to stand on the pads the next day or two, be sure to listen! He may be tired. Allow several days between sessions especially if your horse is older, has been on stall rest for a period of time, or does a lot of swaying when on the pads. This will give the postural muscles time to develop the necessary tone. If your horse does sway a lot in the beginning be sure to note if this decreases after several sessions. Once the horse has learned to totally relax, am I done with it for this horse or do I repeat whenever I feel like it? You can repeat the process whenever you feel your horse is interested in standing on the pads. Some horses will walk over to the pads and indicate the hoof they want. Older horses will seek the comfort of SURE FOOT on a regular basis. If you have a horse that has a particular problem, going into a corner of the arena, walking through a gate or standing on cross-ties, or at a horse show for instance, you can use the relaxation you have developed by moving the pads to the location where there is an issue and repeating the process. This helps your horse to switch from “fight and flight” to relaxation and overcome the pattern of anxiety he has developed. Therefore SURE FOOT can be applied to a wide variety of situations where you would like your horse to relax, be calmer, more confident and move with greater ease. Now that I have started, do I work with the pads for so and so many days or weeks? Or do I work with the pads for one or two days, then leave several days out and start again? Every horse is unique. It is important to let you horse who you which hoof (hooves) he prefers, and the frequency. The only caution is that some horses can become body sore if they stand on the pads too long or too often in the beginning. Therefore when starting out it is better to give the horse a couple of days off in between sessions if you are not sure how your horse is responding. How often can I use SURE FOOT with my horse? Regarding frequency some horses can become body sore if they stand on the pads too often at first. Just think of yourself starting a new exercise program and using muscles you haven’t been using for a while. So while I let the horses determine the program I suggest 2 or 3 x/week with the pads. At a clinic I may put a horse on the pads every day but that’s for a limited number of days (3 – 4) and then they get a break afterward. Most horses are pretty clear when they don’t want to stand on the pads anymore for a while. I know some that only stand on them every few months but they have still made significant changes. So let your horse be your guide but do keep in mind that she may get sore using new muscles. How long should I let him stand on the pads? Can you over do it? The duration varies with each horse. Some horses can only stand on the pads for a few minutes in the first session while others will want to stand for over 30 minutes! When in doubt, shorter less frequent sessions are better. This will give your horse a chance to process the information and avoid the possibility of soreness in the postural muscles. I just heard you reference neuro horses that could have troubles with the system and wondering your thoughts about a horse I am hoping this would work for. He is now 18yrs old and had EPM 4 yrs. ago. Ironically he is the one I am hoping this system could help the most but now I am wondering about his past EPM condition and if it would be a problem and want to know what to look for. Actively neurologic horses will not want to stand on the pads because they can’t. Horses no longer active but suffering from the effects of neuro illness benefit greatly. I have a number of case histories of horses treated for EPM that really improve from SURE FOOT. Is it Ok to give her little tidbits of food while she is on the pad, or it is just ok if she wanders off and have a little bite of food between to pad time? Looks like she rather eat than walk in between stands. It sounds like the pads put her in “grazing” mode (parasympathetic), which is a good thing. I generally try to avoid using food during a session as I think that is working through a slightly different pathway in the brain but it is not “wrong” to let her eat. Every horse is so different as long as you are using SURE FOOT safely (see the DVD for more information) there are very few rules and most of those are, as my friend says, “written in sand”. Therefore, if it seems appropriate to give her tidbits that’s fine. Be aware that we often use food because it satisfies your needs rather than the horse. Can SURE FOOT help my injured horse who damaged his hip and now has a hitch in his stride? I cannot say that SURE FOOT will solve your horse’s hip problem. However, as long as he has an irregular stride he is putting more stress on the other three legs. Just a person with a limp runs the risk of damaging the opposite knee because that leg takes over the work. In this instance SURE FOOT can be extremely helpful is easing the other legs. And in some cases a lingering hitch is because the horse has gotten into the habit of limping. Using the pads will bring your horse’s attention to how he is standing and moving. Therefore, SURE FOOT may alleviate the problem if the injury has healed and this hitch is simply become a habit. My horse have a horse that when he walks his back feet sort of “linger” in the air before being set down on each step-just ever so slightly. He also has a tendency to stand under himself like a goat on a rock. Can SURE FOOT help him? The non-invasiveness of the SURE FOOT Program means that you can explore it with your horse for a wide variety of reasons. Since you offer horse an opportunity to explore the way he stands and moves the applications are endless! Whether you are looking to enhance your horse’s performance, improve gait patterns, overcome anxiety, make it easier for your horse to stand for the farrier or recover from illness and injury and/or helping therapy horses do their job better. And SURE FOOT can lead you to explore new avenues that you may not have previously considered after watching how your horse responds to the Program. My question is knowing what symptoms you would see when working with the pads to identify if it was neuro related. You mention that you have identified some horses with neuro conditions through the use of them and had to discontinue using them in those cases. Can you expand a little further on it so I can watch for signs when I first try Diamond with these pads? It’s retty simple, horses that appear to be neurologic don’t want to stand on the pads, I think because they are already unstable. The pads magnify this and therefore are disconcerting to these horses. Have you ever had a horse react badly to the pads? In almost three years of putting horses on SURE FOOT pads I have only had one horse blow straight up and then act like the pad was the devil. I believe this horse was neurologic based on his reaction and later consulting with a veterinarian who watched video of the way this horse moved. Some horses are very suspicious and if introduced properly to the pads, quickly get over their concerns. But you never know how a horse is going to react the first time therefore it is important to know how to introduce SURE FOOT to your horse. For more information watch the SURE FOOT DVD available at www.surefootequine.com/shop. My horse has has very thick front ankles, which have left him with scar tissue which impairs his flexion A LOT! He often stumbles on uneven ground on the trail and we believe it is due to lack of flexion. I know there is no cure for his bad ankles but was wondering if the pads would help him be able to learn to balance with his limited flexion? SURE FOOT may or may not help depending on the cause of the limited flexion. If, after standing on the pads you see that horse is worse, stop. Use the pads only under the hooves where you see no change or an improvement. The give in the pads may be too much for the body to cope with. However, if you see improvement then short sessions, every few days may help. My horse had a traumatic experience in a trailer. Now each time he gets saddled after that at the tie rack or a trailer he just crumples to the ground. He would not do it if saddled in the open or in the arena so it appeared to be associative thinking. How do I use SURE FOOT to over come associative memories with my horse? Associate memories in horses are just like in people. You experience something in a particular location. Every time you are reminded of that event you experience pleasure or anxiety depending on what happened. SURE FOOT can be an excellent tool in overcoming these types of associative behaviors. First start with the pads in a location where your horse is relaxed to acclimate him to the pads. After several sessions, where it is obvious he goes into a parasympathetic response, deep breathing, lowering his head, softening his eyes, take the pads to the environment where he typically gets anxious. Begin again offering the pads and do not expect him to respond as he does where he isn’t anxious. You may need to repeat this over several sessions. However, gradually the calmness always wins and, using the pads, you can switch his nervous system from “flight and flight” to “grazing” mode. Then gradually introduce another element of the anxiety pattern repeating the pads as necessary to “switch” him from anxiety to calmness. Horses are quicker to let go of old patterns than people when you offer them a way to calm themselves and let go of old behaviors. Am wondering if Sage would benefit on her “nervous” days? I figure it can’t hurt anything either. SURE FOOT has helped many anxious horses become calmer and more relaxed so it is definitely worth a try to see if it will help your horse. And, you are correct in that it can’t hurt! That is one of the keys to the Program. Since you are offering this to your horse she has the right to refuse the pads. Therefore as long as you don’t force the horse to stand on the pads it can’t hurt. I am just beginning the DVD and notice your round red air filled ones in the intro but I don’t see them in your shop. Are these available? The large air-filled discs are not currently available but we are working on having them in stock and available through the on-line shop soon. My horse is super mellow until a canter transition is asked for, then he bucks, which is why I thought I would give your program a try. My question is, how often should I use them? Is it possible to use them too much? I am unable to be on him or have another rider after he has used the pads, so I have him on the lunge line. Any suggestions on why he could be bucking (I know, very broad question) and if Sure Foot can help resolve this issue? There are many reasons why your horse bucks when taking the canter and SURE FOOT may or may not be able to help depending on the cause. Does he canter on his own in the field? If yes, go to next question. If no, there is something that is already uncomfortable as most horses will canter once in a while. Does he take both leads? Again something he should do on his own. If he does not or only takes one lead I suggest you find a “good” chiropractor as he may have structural problems. 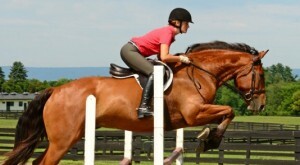 Can he canter without bucking in an enclosed space (arena or round pen) without bucking? With a rider on other than you? As you can see, by this process you will see whether it is the horse, the tack or the rider that is causing the horse to buck. Without this process of elimination there is no way of telling what is causing it and if SURE FOOT will help. However, in regards to working with SURE FOOT while riding you simply have to get on and off your horse during your ride. I have one person who spent the better part of a month getting off her horse to put him on the pads but my o my what a difference it made! How often depends on the horse. They can get body sore so you have to listen if he doesn’t want to stand on them. As he was on for 10 min I would probably give him a couple of days off before doing it again. Think what it is like when you start a new exercise program! I live within the USA. I just received the DVD via the USPS. Where are my other items? Most SURE FOOT orders are drop shipped via Federal Express. If you received your DVD via USPS the remainder of your SURE FOOT order will arrive separately. You will get a email notification that some items are being drop shipped other wise they will be marked “shipped” and are coming from the VA office. Yes, we ship internationally. When you place your order in the store www.surefootequine.com/shop you will be able to see the shipping costs before you complete the order. All international orders are fulfilled from the Virginia office and are shipped using the United States Postal Service via Stamps.com. My order arrived Federal Express but it is not complete. Where are the remainder of my items? Occasionally the drop shipper is back ordered on certain items. We attempt to avoid this situation a best as possible. If you have not received all your items please check your packing slip as it should indicate what is there. Orders will be marked “shipped” from the Murdoch Method shop once the entire order has been shipped. I just placed an order. Should I expect them to be in a separate package or did you forget to send some of the items ordered? Products may arrive in separate packages depending on what was ordered, whether or not it is being drop shipped and if any items are out of stock at the time you placed your order. We make every attempt to keep all items in stock however, sometimes we run out. We apologize for any inconvenience in advance and will make every attempt to notify you if there will be a delay in fulfilling your order. If items are being drop shipped separately you will be notified at the time the order is processed. Please check your spam folder if you do not receive information regarding your order within 2 – 3 days from the time you placed it. I wondered if the sure foot DVDs are currently out of stock? It seems so from the website. If I’m correct, any idea when they will be back in stock? Sometimes we forget to update the available quantities on the website. If it looks like something is out of stock please email us so that we can double check and correct any errors in the shop. If you have any questions regarding your order please email the office at wendy@wendymurdoch.com. We endeavor to complete orders accurately and in a timely manner. However, we occasionally make mistakes. Please let us know if you have any concerns about your order. Do you teach in Europe? Yes, you can find more information on my website. How do I found out about attending a workshop? Look on my website to find a clinic new you. Contact the organizer for more information. How do I host a SURE FOOT Workshop? Please contact Emily Luciano at Emily@murdochmethod.com to find out how to organize a workshop in your area. How can I purchase the SureFoot pads? Click on the link or go to www.surefootequine.com/shop to purchase SURE FOOT products. Yes! Please place an order through the store www.surefootequine.com/shop. Shipping costs will be calculated based on the items you ordered, the speed of shipping and your location. I wanted to order your SURE FOOT DVD but it wasn’t possible. I don’t know why. It didn’t let me go trough to place the order. Can you help? While we do occasionally have a problem with the shop, typically the problem is that you have entered incorrect information. Please double check your billing, shipping and credit card information. If the problem persists please contact the office 540-675-2285, info@wendymurdoch.com. I can’t get into the store. Can you help me? Sometimes the store will not recognize your user name and password. Please check that you have entered your information correctly. If the problem persists please contact the office. We can try to solve the problem and/or you can place your order by phone. 540-675-2285, info@wendymurdoch.com. Do you make a version for dogs, or is there a way to adapt the equine version for a larger canine? At this time we do not have products specific to dogs. However, you can use the same equine SURE FOOT pads with your dogs and for you too! How does SURE FOOT work? We are not sure of all the ways in which SURE FOOT affects the nervous system in the horse. Clearly there are a wide variety of receptors being affected and brain chemicals released as evidenced by the visible signs; eyes softening, licking and chewing, deep breathing, relaxation, neck lowering, etc. I am curious what instigates the chemical processes that take place for the horse who really benefits from the pads. Endorphin release but how does being on the pad trigger it? We are not sure at this time. Is anyone doing research on SURE FOOT? We hope to be able to conduct some research studies on how SURE FOOT is affecting the horse’s nervous system. At present there are no studies being conducted. How you came up with the idea Wendy? Please go to www.murdochmethod.com and click on SURE FOOT in the menu bar. 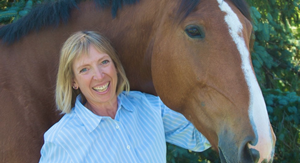 Read the story of Dante, the first horse to find out how Wendy came up with the idea for SURE FOOT. Are farriers using SURE FOOT when they work on horses? Are there articles that I can read about SURE FOOT? Check out our Facebook page for awesome testimonials!